ROUSH CleanTech is offering a special discount on the 2009 – 2010 Ford F-250 / F-350 in-bed tank fuel system to propane industry professionals. Read on for details! 4.27.2011 — New propane fueling infrastructure showcases how Wright & Filippis, ROUSH CleanTech, and Clean Energy Coalition are partnering to deploy clean vehicles in Michigan. 4.13.2011 — ROUSH CleanTech Ford E-series cargo van, F-550 Super Duty truck, and MicroBird G5 school bus, all fueled by propane autogas, on display. 4.7.2011 — President Obama’s National Clean Fleets Partnership outlines energy security objectives for U.S. fleets, including use of propane autogas. 3.29.2011 — Mouw to speak at Alaska North Slope Propane Conference on sustainability, performance of propane autogas truck in State of Alaska’s Department of Transportation fleet. “SuperShuttle franchisees use about 200 gallons of fuel each week, and travel up to 600,000 miles over the lifetime of their vehicle. By making the switch to propane autogas, our drivers are not only saving money and lowering our dependence on foreign oil, but reducing carbon emissions by the ton, and this is something they can feel good about.” — Ken Brooks, national purchasing manager, SuperShuttle. “Propane autogas is a good fit for us. We anticipate purchasing propane fuel for half the price of diesel. It will reduce our dependency on diesel and drive down our cost of operation.” — Edgar Benning, general manager, Flint Mass Transportation Authority. Americans are constantly in motion. Business entrepreneurs, volunteers, students, and families are all in need of ground transportation service providers they can rely on to get them to their destinations — on time and at the right price. Whether using public transportation, hailing a cab, or carpooling to events, ground transportation companies pick people up, and now they can do it cleaner, greener, and cheaper. Propane autogas vehicles are a smart choice for ground transportation companies that want to lower their operating costs. The cost of propane autogas is up to 40 percent lower than gasoline, and this clean-burning fuel lowers maintenance costs. These alternative fuel vehicles maintain the factory Ford warranty coverage, offer a comparable driving range to gasoline vehicles, make use of a domestic fuel source, and lower greenhouse gas emissions. And with little additional weight added to the vehicle, you can load up with passengers, luggage, and everything else you’ve become accustomed to both conveniently and economically. 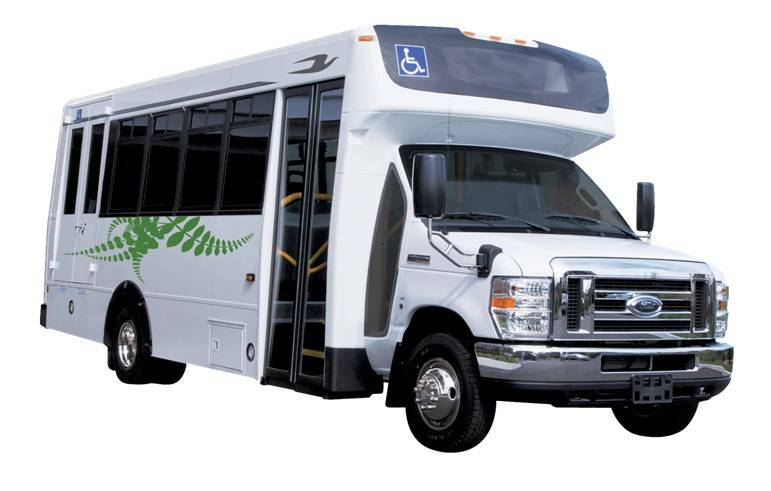 The Ford E-450 shuttle is an example of an eco-friendly transportation choice. Perfect for hotels, churches, private companies, and specialized public transit jobs needing room for up to 30 passengers, this ROUSH CleanTech powered vehicle utilizes the Ford 6.8-liter, V-10 engine powered by propane autogas. In addition to EPA and CARB certification, the ROUSH CleanTech powered Ford E-450 has completed the Federal Transit Administration’s (FTA) New Model Bus Testing Program (referred to as “Altoona Testing”). “Altoona Testing…will allow all agencies to apply for FTA funding to assist with conversion costs of that vehicle,” said Lynn McClean, director of maintenance for Flint Mass Transit Authority (MTA). To put the environmental impact of switching to propane autogas in perspective, by replacing 50 shuttles traveling 75,000 miles per year with ROUSH CleanTech vans, a company will be saving over $185,000 per year and removing more than 1 million pounds of carbon dioxide from the atmosphere each year. To estimate a fleet’s cost and pollutant savings with propane autogas, visit ROUSH CleanTech’s online Savings Calculator. Up to 20 percent less nitrogen oxide. 17 to 24 percent fewer greenhouse gas emissions. No loss in engine performance. Very little additional weight to the vehicle. Comparable driving range between fill-ups. Maintains the factory vehicle warranty. Lower fuel costs by up to 40 percent. Explore our recommended ROUSH CleanTech vehicles and conversion systems for your ground transportation requirements. To find out about federal or state tax incentives, click here to check out credits and programs available to save you money when considering the switch to propane autogas. Many customers have already adapted the ROUSH CleanTech liquid propane autogas fuel system into their fleet. Read about some of their experiences. For more information about how ROUSH CleanTech serves the ground transportation market, contact us at 800.59.ROUSH. “Public fleets in particular have a responsibility to take the lead and take steps to achieve significant greenhouse gas reductions within their own fleets. We take pride in doing what we can to protect our sensitive environment.” – Robert Toppen, equipment supervisor for King County Department of Transportation. During the 1970’s America imported approximately 35 percent of its oil supply. Today, about 60 percent of the oil consumed in the U.S. is imported, with 70 percent of that used by modes of transportation. The U.S. imports an average of 274 million barrels of crude oil each month. Countries where America imports much of its crude oil include Saudi Arabia, Nigeria, Iraq, Mexico, Venezuela, and Algeria. Packing a cleaner, greener approach to transportation, propane-autogas-powered vehicles significantly reduce emissions, with 12 percent less carbon dioxide, about 20 percent less nitrogen oxide, up to 25 percent less greenhouse gases, and up to 60 percent less carbon monoxide than gasoline-powered vehicles. In 1910, Dr. Walter O. Snelling, a chemist and explosives expert for the U.S. Bureau of Mines, was contacted to investigate vapors coming from a gasoline tank vent of a newly purchased Ford Model T. The automobile owner complained that the gallons of gasoline he purchased became only half-gallons by the time he arrived at his home.